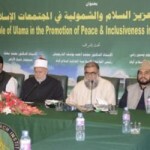 Speakers in a national seminar resolved that a peaceful dialogue in the light of Islamic education was mandatory for the elimination of terrorism, extremism from the society and women could play a vital role in this regard. The women speakers including parliamentarians and Wafaq ul Madaris also resolved that women could play an important role in building of a society. 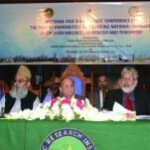 They were speaking at the conference jointly organized by Islamic Research Institute (IRI) of International Islamic University (IIU), Female Campus Directorate of the University and Council of Islamic Ideology in collaboration with Women’s Parliamentary Caucus of Pakistan, National Commission on Status of Women on ‘ Role of Dukhtaran e Pakistan in Reconciliation and Peace Building in continuation with Paigham e Pakistan’ held at Faisal Masjid campus. 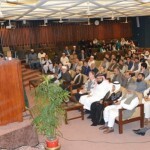 The seminar recommendations were presented by Chairman Council of Islamic Ideology, Dr. Qibla Ayaz. Participants maintained that the points would be sent to the legislative quarters and this communiqué would be part of the next edition of Paigham e Pakistan. The speakers recommended that opportunities for personal identity must be provided to women. In the four panel discussion sessions, speakers said that role of media was important for characterization of women and children and special programs should be organized in this regard. 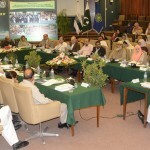 The resolutions also said that national educational curriculum should be prepared according to the modern needs. Speaker Balochistan Assembly Rahila Durani speaking on the occasion said there was lack of implementation of women rights in the society. She said practical measures were needed for safety of women rights and for their meaningful role. In this regard, she said a bill was being presented in the assembly to prevent pre mature marriages. Rector IIUI Dr Masoom Yasinzai stressed the need for imparting modern education based on critical thinking and characterization integrated with the blend of Islamic character. He added that there was no place for terrorism in Islam and added that IIUI took the responsibility to provide a narrative to the nation to remain clear about Islam, its teachings and dissemination of message of peace. He urged for the promotion of the attitude of peaceful co-existence. President IIUI, Dr Yousif Al Draiweesh said Islam was the only religion which gives complete rights to women. He called upon the Muslim societies to practice and provide the rights to women granted by Islam. He maintained that university was keen for women empowerment and its separate campus for females was visible example where as many as 14 thousand females were getting quality education. He added that the number of female students was more than male students at the university. Director General IRI, Dr. Zia ul Haq elaborated the journey of Paigham e Pakistan and told that it commenced with a muster of religious scholars at IRI in program on reconstruction of Pakistani society where a decree was announced against terrorism. He added that the decree was endorsed by all the religions’ scholars in a program at IIUI and also same was endorsed by the VCs of more than 80 universities. 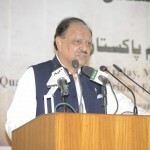 He told that after the launch of Paigham e Pakistan, this program was the continuity of that effort. Seminar was also joined by Mrs. Khalid Iqbal Jhagra, Director female campus Dr. Farkhanda Zia, representatives of Wifaqul Madaris including Asma Baig, Naber Andleeb, Razia Madni, Tayyeba Khanum, Durdana SIdiqui and MNAs Farhana Qamar, Shazia Sobia, Romeena Alam and Huma Chughtai.